^ "Stereotypes | Simply Psychology". www.simplypsychology.org. Archived from the original on 11 February 2011. Retrieved 25 March 2018. ^ a b McLeod, Saul. "Stereotypes". Simply Psychology. Archived from the original on 11 February 2011. Retrieved 12 March 2018. ^ "U.S. video gamer gender statistics 2018". Statista. Retrieved 27 June 2018. ^ "The biggest mobile phone gamers". gameanalytics. Retrieved 24 February 2019. ^ "Frequently Asked Questions". implicit.harvard.edu. Retrieved 14 April 2018. ^ Vega, Tanzina. "Working while brown: What discrimination looks like now". CNNMoney. Retrieved 26 March 2018. ^ a b c Fiske, Susan T. (1998). "Stereotyping, Prejudice, and Discrimination". In Gilbert, Daniel T.; Fiske, Susan T.; Lindzey, Gardner (eds.). The Handbook of Social Psychology. Volume Two (4th ed.). Boston, Mass. : McGraw-Hill. p. 357. ISBN 978-0-19-521376-8. ^ a b c d Denmark, Florence L. (2010). "Prejudice and Discrimination". In Weiner, Irving B.; Craigheaid, W. Edward (eds.). The Corsini Encyclopedia of Psychology. Volume Three (4th ed.). Hoboken, N.J.: John Wiley. p. 1277. ISBN 978-0-470-47921-6. ^ a b c d e f g h i j k l m Tajfel, Henri (1981). "Social stereotypes and social groups". In Turner, John C.; Giles, Howard (eds.). Intergroup behaviour. Oxford: Blackwell. pp. 144–167. ISBN 978-0-631-11711-7. ^ a b Operario, Don; Fiske, Susan T. (2003). "Stereotypes: Content, Structures, Processes, and Context". In Brown, Rupert; Gaertner, Samuel L (eds.). Blackwell Handbook of Social Psychology: Intergroup Processes. Malden, MA: Blackwell. pp. 22–44. ISBN 978-1-4051-0654-2. ^ a b c Cuddy, Amy J. C.; Fiske, Susan T. (2002). "Doddering But Dear: Process, Content, and Function in Stereotyping of Older Persons". In Nelson, Todd D (ed.). Ageism: Stereotyping and Prejudice against Older Persons. Cambridge, Mass. : MIT Press. pp. 7–8. ISBN 978-0-262-14077-5. ^ Dovidio, John F.; Gaertner, Samuel L. (2010). "Intergroup Bias". In Susan T., Fiske; Gilbert, Daniel T.; Lindzey, Gardner (eds.). Handbook of Social Psychology. Volume Two (5th ed.). Hooboken, N.J.: John Wiley. p. 1085. ISBN 978-0-470-13747-5. ^ Mackie, Diane M.; Hamilton, David L.; Susskind, Joshua; Rosselli, Francine (1996). "Social Psychological Foundations of Stereotype Formation". In MacRae, C. Neil; Stangor, Charles; Hewstone, Miles (eds.). Stereotypes and Stereotyping. New York: Guilford Press. pp. 48–49. ISBN 978-1-57230-053-8. ^ Meiser, Thorsten (2006). "Contingency Learning and Biased Group Impressions". In Fiedler, Klaus; Justin, Peter (eds.). Information Sampling and Adaptive Cognition. Cambridge: Cambridge University Press. pp. 183–209. ISBN 978-0-521-83159-8. ^ a b Berndsen, Mariëtte; Spears, Russel; van der Pligt, Joop; McGarty, Craig (2002). "Illusory correlation and stereotype formation: making sense of group differences and cognitive biases". In McGarty, Craig; Yzerbyt, Vincent Y.; Spears, Russel (eds.). 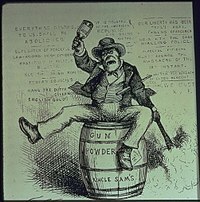 Stereotypes as explanations: The formation of meaningful beliefs about social groups. Cambridge: Cambridge University Press. pp. 90–110. ISBN 978-0-521-80047-1. ^ a b Stroessner, Steven J.; Plaks, Jason E. (2001). "Illusory Correlation and Stereotype Formation: Tracing the Arc of Research Over a Quarter Century". In Moskowitz, Gordon B. (ed.). Cognitive Social Psychology: The Princeton Symposium on the Legacy and Future of Social Cognition. Mahwah, N.J.: Lawrence Erlbaum Associates. pp. 247–259. ISBN 978-0-8058-3414-7. ^ Devine, Patricia G.; Monteith, Margo J. (1999). "Automaticty and Control in Stereotyping". In Chaiken, Shelly; Trope, Yaacov (eds.). Dual-Process Theories in Social Psychology. New York: Guilford Press. pp. 341–342. ISBN 978-1-57230-421-5. ^ a b Bargh, John A. (1994). "The Four Horsemen of Automaticity: Awareness, Intention, Efficiency, Control in Social Cognition". In Wyer, Robert S.; Srull, Thomas K. (eds.). Handbook of Social Cognition. Two (2nd ed.). Hillsdale, NJ: Lawrence Earlbaum. p. 21. ISBN 978-0-8058-1056-1. ^ Devos, Thierry; Huynh, Que-Lam; Banaji, Mahzarin D. (2012). "Implicit self and identity". In Leary, Mark R.; Tangney, June Price (eds.). Handbook of self and identity (2nd ed.). New York: Guilford Press. p. 164–165. ISBN 978-1-4625-0305-6. ^ Dijksterhuis, Ap (2001). "Automatic social influence: The perception-behavior links as an explanatory mechanism for behavior matching". In Forgas, Joseph P.; Williams, Kipling D. (eds.). Social influence: direct and indirect processes. Philadelphia, PA: Psychology Press. p. 99–100. ^ Operario, Din; Fiske, Susan T. (2001). "Causes and Consequences of Stereotypes in Organizations". In London, Manuel (ed.). How People Evaluate Others in Organizations. Mahwah, N.J.: Lawrence Erlbaum. p. 2012. ISBN 978-0-8058-3612-7. ^ Jussim, Lee; Cain, Thomas R.; Crawford, Jarret T.; Harber, Kent; Cohen, Florette (2009). 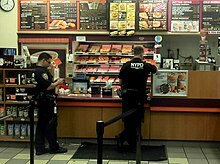 "The unbearable accuracy of stereotypes". In Nelson, Todd D (ed.). Handbook of prejudice, stereotyping, and discrimination. New York: Psychology Press. pp. 199–227. ISBN 978-0-8058-5952-2. ^ a b Zemore, Sarah E.; Fiske, Susan T.; Kim, Hyun-Jeong (2000). "Gender Stereotypes and the Dynamics of Social Interaction". In Eckes, Thomas; Trautner, Hanns Martin (eds.). The Developmental Social Psychology of Gender. Mahwah, NJ: Lawrence Erlbaum Associates. pp. 229–230. ISBN 978-0-585-30065-8. ^ a b Crocker, Jennifer; Major, Brenda; Stelle, Claude (1998). "Social Stigma". In Gilbert, Daniel T.; Fiske, Susan T.; Lindzey, Gardner (eds.). The Handbook of Social Psychology. Volume Two (4th ed.). Oxford: Oxford University Press. pp. 519–521. ISBN 978-0-19-521376-8. ^ Quinn, Diane M.; Kallen, Rachel W.; Spencer, Steven J. (2010). "Stereotype Threat". In Dividio, John F.; et al. (eds.). The SAGE Handbook of Prejudice, Stereotyping and Discrimination. Thousand Oaks, CA: SAGE Publications. pp. 379–394. ISBN 978-1-4129-3453-4. ^ Inzlicht, Michael; Tullett, Alexa M.; Gutsell, Jennifer N. (2012). "Stereotype Threat Spillover: The Short- and Long-Term Effects of Coping with Threats to Social Identity". In Inzlicht, Michael; Schmader, Toni (eds.). 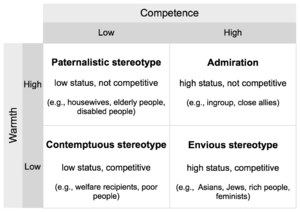 Stereotype Threat: Theory, Process, and Application. New York, NY: Oxford University Press. p. 108. ISBN 978-0-19-973244-9. ^ Aronson, Joshua; Stelle, Claude M. (2005). "Chapter 24: Stereotypes and the Fragility of Academic Competence, Motivation, and Self-Concept". In Elliot, Andrew J.; Dweck, Carol S. (eds.). Handbook of Competence and Motivation. New York: Guilford Press. pp. 436, 443. ISBN 978-1-59385-123-1. ^ Banaji, Mahzarin R. (2002). "The Social Psychology of Stereotypes". In Smelser, Neil; Baltes, Paul (eds.). International Encyclopedia of the Social and Behavioral Sciences. New York: Pergamon. pp. 15100–15104. doi:10.1016/B0-08-043076-7/01754-X. ISBN 978-0-08-043076-8. ^ Fiske, Susan T.; Lee, Tiane L. (2008). "Stereotypes and prejudice create workplace discrimination". In Brief, Arthur P (ed.). Diversity at Work. New York: Cambridge University Press. pp. 13–52. ISBN 978-0-521-86030-7. ^ Sinclair, Stacey; Huntsinger, Jeff (2006). "The Interpersonal Basis of Self-Stereotyping". In Levin, Shana; Van Laar, Colette (eds.). Stigma and Group Inequality: Social Psychological Perspectives. Claremont Symposium on Applied Social Psychology. Mahwah, NJ: Lawrence Erlbaum Associates. p. 239. ISBN 978-0-8058-4415-3. ^ "Using information literacy to promote critical thinking - ProQuest". search.proquest.com. Retrieved 26 April 2018. ^ "Lesson 2 – Stock Characters | BYU Theatre Education Database". tedb.byu.edu. Retrieved 30 March 2018. ^ Burgess, Melinda; Dill, Karen (15 September 2011). "Playing With Prejudice: The Prevalence and Consequences of Racial Stereotypes in Video Games". Media Psychology. 14 (3): 289–311. doi:10.1080/15213269.2011.596467.